BSNL has entered into an MoU with Indian Army for providing telecommunication services on a pan India basis. BSNL will provide services like leased circuits, basic telephone, PRIs etc. for a period of 3 years to Indian Army. 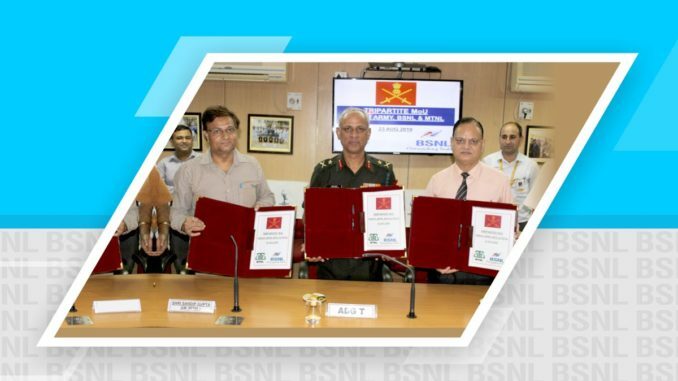 Presently, BSNL is also providing broadband and mobile services through another existing MoU between BSNL and Indian Army. BSNL had earlier signed MoU with the Indian Air Force on for providing various telecom services for a period of 5 years. “BSNL is proud to serve the defence Forces, and it is our endeavour to provide reliable and efficient telecommunication services to defence establishments,” says N.K. Mehta director (enterprise), BSNL. Vodafone Idea: Big is beautiful?